Times: The Village is open 9:30 am - 4:00 pm. Hands-on workshop times vary; pre-registration is required. Cost: Cost is $14 per Scout for full-day admission to Old Sturbridge Village. One adult per Scout ages 5 and above is admitted at the rate of $15. Hands-on workshops are an additional fee. Join us for our spring Scout Day! 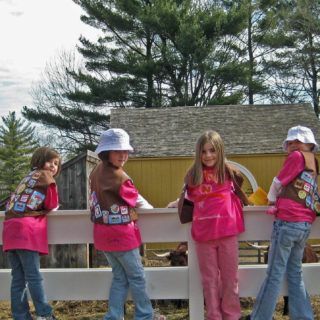 Scout Days offer you and your troop the opportunity to explore the Village and participate in hands-on activities. This is a great opportunity for Scouts to gain exposure to many aspects of 1830s New England life in an interactive way. We recommend that you allow for up to three hours to visit the Village, in addition to any scheduled hands-on workshops. Workshops are open to Scouts (and their siblings!) ages 5 to 17. Stay tuned for a more complete list of the exciting activities that will be offered in the Village, just for Scouts! A Map Guide with times will be posted online the week of Scout Day. Cost is $14 per Scout for full-day admission to Old Sturbridge Village. One adult per Scout ages 5 and above is admitted at the rate of $15. Additional adults pay the full price rate. Hands-on workshops are an additional fee. Village admission tickets can be purchased online here or at the door. Whether you want to work towards one of your badges or just try out an activity for fun, we offer a wide variety of hands-on workshops for Scouts and siblings of all ages. Pre-registration is required and workshops often fill up quickly. Workshops can accommodate 12 participants, except where noted. Scouts’ siblings are welcome to attend as well! All workshops are located in the Museum Education Building. See listings below for requirements covered during the workshop. Some requirements will need to be completed outside of the visit to Old Sturbridge Village. Be resourceful! What did people do to care for themselves in the early 19th century? How did they clean their teeth, get rid of a stomach ache, and clear the air? What plants and other natural resources were used to treat the family? Make and experience early 19th-century remedies and an herbal sachet. Assist in making honey cake and mint tea. Discuss children’s work and play in the early 19th century and compare these with today. Learn about kitchen gardens, heirloom plants and honey bees. Attend a “garden party” and take on the role of a friendly hostess! On your own, visit the Village’s industrious bees. Be an inventor of fun! Look at games from America’s past that we still play today. Are they the same or different? Learn about children’s lives and the creative ways in which they created their own fun. Together we will create and play new games. Craft your own game piece and invent your own game. Test your memory, sight, smell, touch, and hearing as if you were a child in the early 19th century. What would you have known, seen, smelled, felt, and heard two hundred years ago at home, school, and work in rural New England? Use all of your senses to make an herbal sachet. Participants will also get a five senses scavenger hunt to bring into the Village with them. It’s spring! Learn about heirloom plants that are grown in the five different types of gardens at OSV. Investigate the different types of plants and their stages of growth. Plan your own dream garden based on what you learn. Take away your own garden experiment. Experience cooking 19th-century style, using common household tools and recipes. Explore innovations and compare family life then and now. Bake apple fritters over an open hearth! *This program will complete Steps 1 & 2. Accompanying recipe booklet will allow you to complete Steps 3, 4 & 5 at home. Learn about where your food comes from! Participants will explore how people grew and preserved food in the 1830s and compare it to today. Plant seeds to take home and work in the garden using 19th-century garden tools. Let’s play games that kids played in the 1830s! Build teamwork skills as you play together and create your own games. Tigers will learn fun games from the past, play a game as a team, and make a game piece to bring home and share with their friends and family. Tiger Tales People in the 1830s loved to tell stories! Listen to folk songs and a tall tale from the past, then create colorful art to go with it. Scouts will also learn a fun historic game. Gardens were crucial to life in the 1830s, allowing people to grow what they needed to eat. Learn about growing conditions for seeds and how to maintain a stellar garden. Craft a terrarium to take home and use as an indoor garden! These workshops are not specifically badge-related, but are a great opportunity to try out a new craft individually or together as a group! Siblings are welcome, too. These workshops may also help your scout fulfill certain badge requirements! See below for details. Learn about food storage and cooking as you experience cooking 19th-century style using common household tools and recipes. Make and enjoy a recipe for a snack to share together! Explore the printing trade by using a real printing press! Participants will also get the chance to marble their own unique piece of marbled paper and practice their penmanship with quill and ink. The process of making clothing in the 1830s was a little different than it is today. Step into the role of an 1830s villager and learn about the hard work behind making sheep’s wool into fabric. Participants will get hands-on experience carding wool from the Village’s own sheep and then weaving thread into cloth. Use a variety of 19th-century tools to make a bootjack, a useful tool to help you remove your muddy boots! Participants will learn how to be safe with woodworking tools, too. Spring has sprung! Bring your artistic skills outside and get inspired by nature. Participants will check out one of the Village’s gardens and then paint what they see. Practice your woodworking skills in this extended woodworking program. Learn about tool usage and safety and then put your knowledge to the test as you make a 6-board chest. This chest is perfect for keeping all of your treasures.